Whether you prefer a short morning ride in the hills surrounding the Ranch, or an extended ride along the various Forest Service approved trails, equestrians will find a seemingly endless variety of riding options available to them at SMR. Scroll down to the map of the trail system accessible to SMR boarders to learn more about the terrain, duration and destinations serviced by this diverse collection of trails. 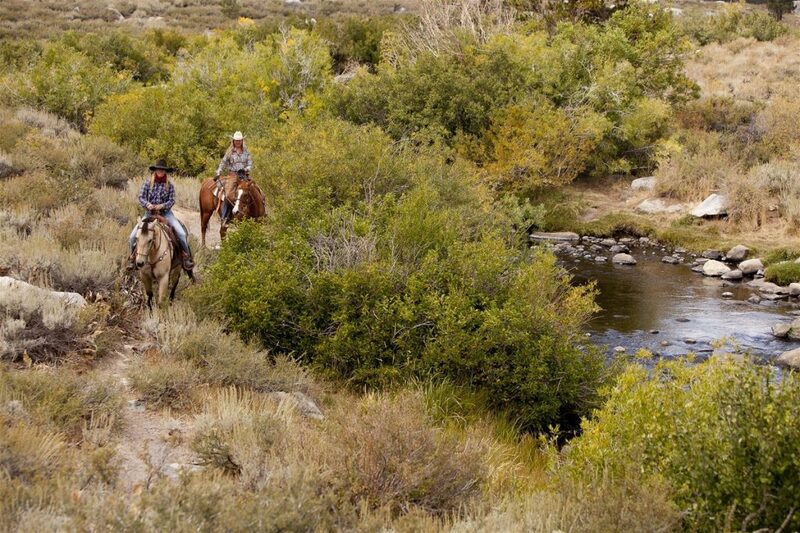 Of course, our staff will gladly work with guests to plan the ideal journey for equestrians of all abilities. Alternatively, for riders wishing to enhance their equestrian skills, or simply to work their horses, SMR features a generous, well maintained riding arena. Guests may utilize the riding arena upon availability, or by reservation (included with the Premium Boarding package). 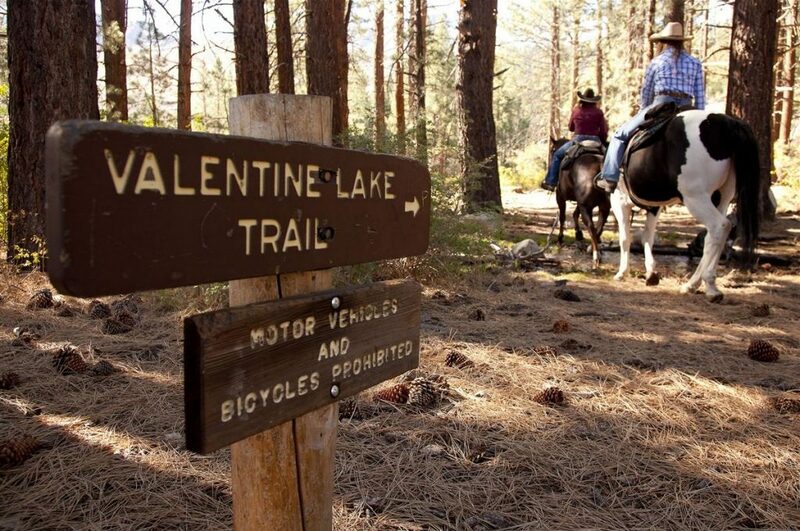 The ranch is ideally situated in the Sherwin Recreation Area for those wanting to explore the nearby equestrian, walking, hiking and biking trails; Sherwin Lakes Trail, Valentine Lake Trail, Mammoth Rock Trail and Town Loop. Nearby destinations and points of interest include Mammoth Creek, Mammoth Creek Park and the historical Hayden Cabin, all just steps away. With its relatively lower-elevation trailhead in the aspen groves and old-growth Jeffrey pines off Sherwin Creek Road near the motocross track, this trail is an excellent option in the spring and early summer, when the lakes are full and clear and the wildflowers are blooming. In just 3 miles the trail climbs steeply in a series of switchbacks to a small plateau and a pair of small lakes beneath the high peaks of the Sherwin Range, affording wide vistas back across the town of Mammoth Lakes and the Long Valley Caldera. From its trailhead off Sherwin Creek Road, just east of the Sherwin Creek Campground, the Valentine Lake Trail climbs steeply from sagebrush chaparral through open, old-growth Jeffrey pine forest to a bench at the base of the Sherwin Range and a junction with the Sherwin Lakes Trail. The trail then follows the creek into the John Muir Wilderness. Return the way you came or make a loop by way of Sherwin Lakes. Enjoy the expansive views back across the Mammoth Creek drainage and the Long Valley Caldera. 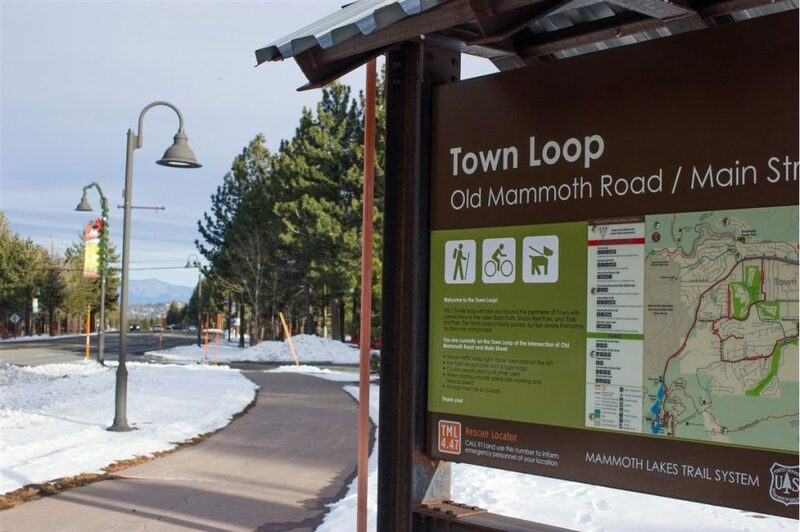 The main hub of the Mammoth Lakes Trail System, the Town Loop--made up of multi-use path, on-street sections, promenades and bridges--provides a family-friendly tour of town with access to a variety of outbound trails and staging areas. Mammoth Creek Park is a popular start point from which you can tour the eastern half of Mammoth--offering sweeping views of the Sherwins and connections to local schools, the library and dining/shopping--or the western portion, which cruises sleepily through Old Mammoth and past the Valentine Reserve to Eagle Lodge before turning into a quiet neighborhood on its way back out to the Main Street frontage road.